This website is intended to give an introduction to the viral family Togaviridae. Below is a quick summary of the key members, along with additional information provided by following the links. Please enjoy. Genus Rubivirus has only one member which causes disease in humans; Rubella virus. This virus causes one of the "red rashes of childhood," and was common until the creation of the rubella vaccine. Alphaviruses are, as we in H&V like to call them, the rollar coaster viruses, "WEE EEE VEE!". 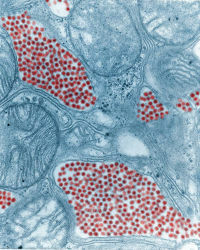 These viruses are transmitted by insect vectors, and are the family which makes up group A of arboviruses (arthropod-borne viruses).